Rocker Ted Nugent recently spoke with Music Recall Magazine. Check out MRM’s exclusive interview with “The Motor City Madman” below. 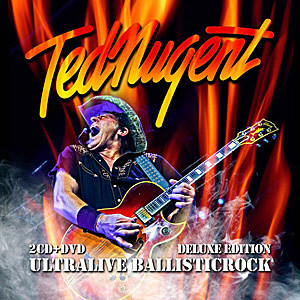 Nugent’s new live CD/DVD/Blu-Ray release “Ultralive Ballisticrock” is out NOW and can be purchased wherever music is sold. Nugent: My bands forever have been dreambands for any guitarplayer, but Mick, Greg and Derek bring such a ferocious throttle and soulful authority to my amazing songs that it would be criminal to not share it with the world. There simply is no tighter more passionate band on earth and people will be reminded that the ultimate American Dream is putting your heart and soul into everything you do to be the absolute best that you can be. My boys personify this indefatigable spirit and attitude. My songs and concerts are just more fun than any others. MRM: What does having Derek St. Holmes back in the band full-time mean? Nugent: It is wonderful as his very special voice and guitarplaying are integral to the identity of those classic songs he originally sang on. He has never sung or played guitar better and he is a real asset to my incredible music. We were both raised on the magical music of our black heroes, so we share a super bond to carryon this phenomenal soulful music. He is my MotorCity SoulBrother BloodBrother. MRM: With your recent live performances of “Wango Tango,” you have omitted the tale of the Maserati. Have you finally parked the Maserati in the garage for good? Nugent: No not at all. Afterall I am the ultimate conservationist and conservation is the wise use of resources so the firebreathing hotrod is merely having its oil changed while me and the boys submerge ourselves into the Cool Jerk. MRM: How do you keep so energized on and off stage? What’s your secret? Nugent: My unbridled love of the music combined with my athletic, clean and sober mind, body, spirit and soul give me Herculean energy and spirit and indefatigable drive to pursue all musical roads less traveled. I think all that pure venison helps a lot too. MRM: Do you have any new music planned for the future? Nugent: Killer, magical guitar licks, exciting patterns and song infrastructures blowup from my fingertips everytime I fondle my guitars. I’ve got a good dozen fun, intense R&B lovesongs ready to go. God knows me and the band are dying to record these masterpieces ASAP. Logistics, timing and coordinating schedules is a Herculean task, but with any luck we should hit the studio in early 2014 for a summer release of a killer CD. MRM: What are your 2014 tour plans looking like? Please make several stops in the Carolinas! Nugent: As always, we will attack the American R&B&R&R road come summer 2014, hopefully with the new killer record and book out as well. Never a dull moment. Stay tuned. I am.